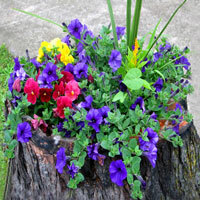 Earlier this month, our Facebook fan Carol posted her tree stump planter on our Facebook wall. Within a few hours, over 1,000 fans had liked it! Talk about a garden success! And even “Like” is too subtle a word. Our fans LOVED it! They shared and commented in huge numbers, and many asked “how to you make this”? After one fan, Marie, emailed me personally, I promised I’d find out. SO… after reading stories of gardeners making tree stump planters, and talking to a friend in Connecticut who made a lovely tree stump planter along her sidewalk, planting a Shasta Daisy in it — here’s are some “how to” tips! Basically, I see two ways to make them. There’s a “great” way — and results in what you see above — and there’s an “easy” way, that looks different but could also be spectacular. Let’s start with the “great” way! 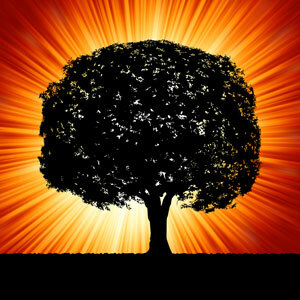 “Begin with the end in mind,” wrote Stephen Covey in his book The 7 Habits of Highly Effective People. We’ll try that here. This photo shows exactly what the end will look like, with an angle that shows what’s happening. In the end, we want a hollowed-out “bowl” in the top of the stump..
How deep you go probably depends on what you want to plant. I suspect annuals with shallow roots won’t need much depth, and doubt anything needs more than 6 inches of depth if you use a good growing medium (more on that in a moment). This Old House has a very articulate description of this part: They recommend starting a hole by hitting the middle of the stump with the sharp end of a mattock. 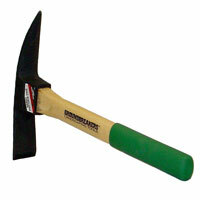 If you’re like me, you may think of a mattock as a pickaxe. And while a big strong pickaxe like this would definitely get the job done, it may be a bit heavy or even a bit dangerous to be swinging. Typical pickaxes are at least 36″ long and weigh five pounds or more. If you don’t have one, ymaybe a neighbor or friend or uncle has one — and maybe one of them (or maybe your husband!) can do this part. If you want to try a lighter pick that’s easier to lift and use, they are out there. Here’s one that’s only 16″ long and weighs less. It’s designed to reduce hand and arm fatigue, and be easier on your back. Yeah!! You can check it out on Amazon: it’s called the Mini Pick. Out of 27 Amazone reviews, 20 are 5-star — the highest rating. But you may want to read some of the negative reviews before you buy. Some buyers are concerned about the Mini Pick’s durability. Ahhh, drain holes! Some say you need them. Others won’t buy a planter without them. All I can say is, having surveyed over a hundred container gardeners in Michigan, Georgia, and California, many believe that drain holes prevent root rot. So I’d suggest drilling some drain holes. Again, show this so well. 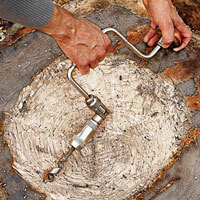 Here’s a photo of them using a hand drill to drill out the sides. Click over to their site for details. I probably would use a power drill myself, but that’s just me. I think it’s smart to drill at the bottom sides, and angle them down and out, so no water sits inside your stump planter. Will the holes clog? Sure! As you may do with other containers, you can put some stones or gravel in the bottom to let water escape. Or do what my neighbor does — an old nylon stocking with the broken pieces of styrofoam coffee cups. It’s cheap and it works! 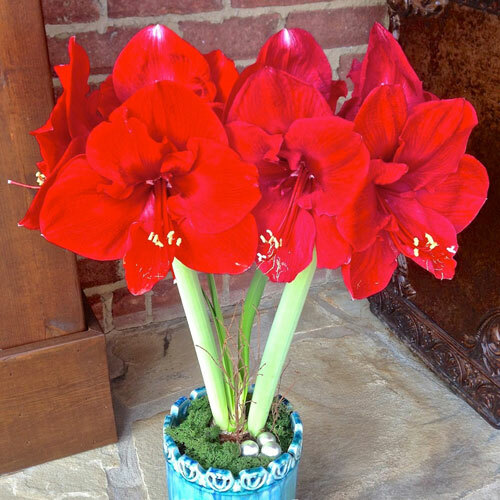 My guess is you know exactly what you like to plant flowers in. Probably some kind of potting soil. You know what works for you, and for the flowers you grow, so by all means, have at it! That said, I’m biased. To me, Mel’s Mix, described in Mel Bartholomew’s book, Square Foot Gardening, makes so much sense. It’s a mix of 1/3 Vermiculite, 1/3 Peat (or you can use Coir instead), and 1/3 well-blended compost. 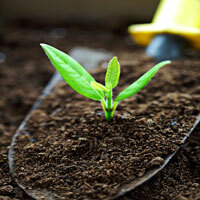 The compost provides the nutrients so you’ll never need to fertilize. 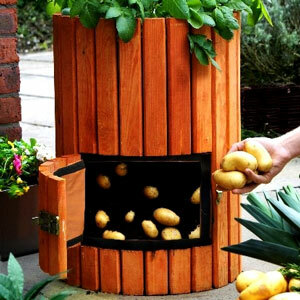 And you never need to replace the vermiculte or peat/coir. The only thing you’ll need to to add over time is more compost. OK, time to have fun! You can do something simple, like my friend who planted a single, elegant Shasta Daisy — or you can go for a lush combination. Or something in between! 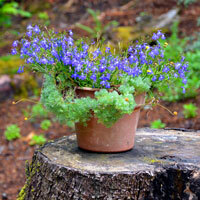 I believe these are blue Forget-Me-Nots in a pot on this tree stump. I think it looks lovely! 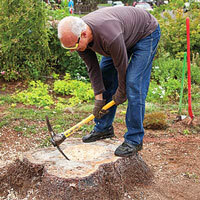 Tree Stump Planter: An Easy Way! Now, there’s another approach that probably sounds silly. It probably IS silly. 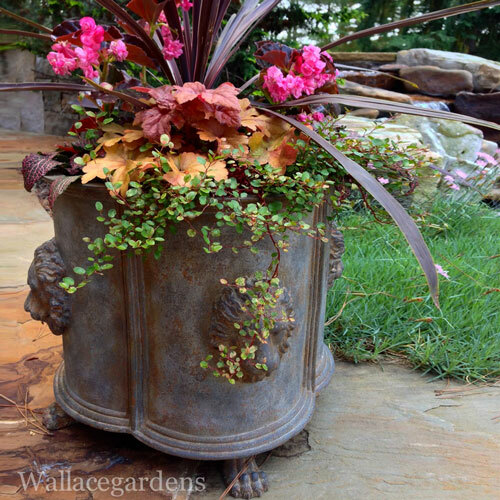 But if you want, why not just take a planter you think will look nice on the stump and set it on top? 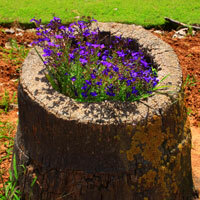 Your stump becomes a natural planter stand! 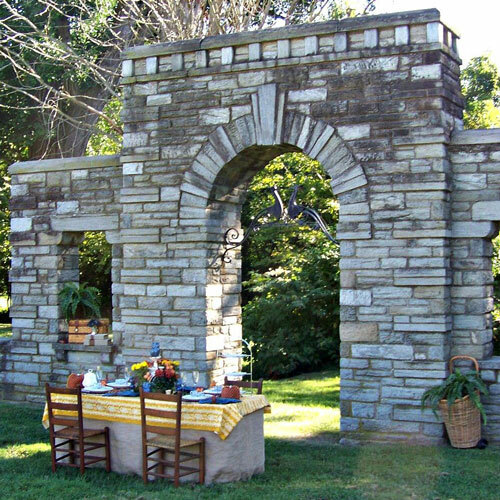 Any other ideas — please sound off in a COMMENT, or post a picture on our Facebook Page.